I really love this bag. It’s a nice size for all of my cosmetics and a few other things. Just purchased and used on a week’s vacation. Nice and classy looking and fit very nicely in my luggage. I highly recommend. When living with a chronic illness, keeping track of all your pills can be a nightmare. This bag has room for all of my meds and supplements- both big bottles and small, with room left over for otc medications. You aren’t supposed to store medication in the bathroom, and that’s what makes this bag so handy; I can discreetly keep my pills somewhere else. 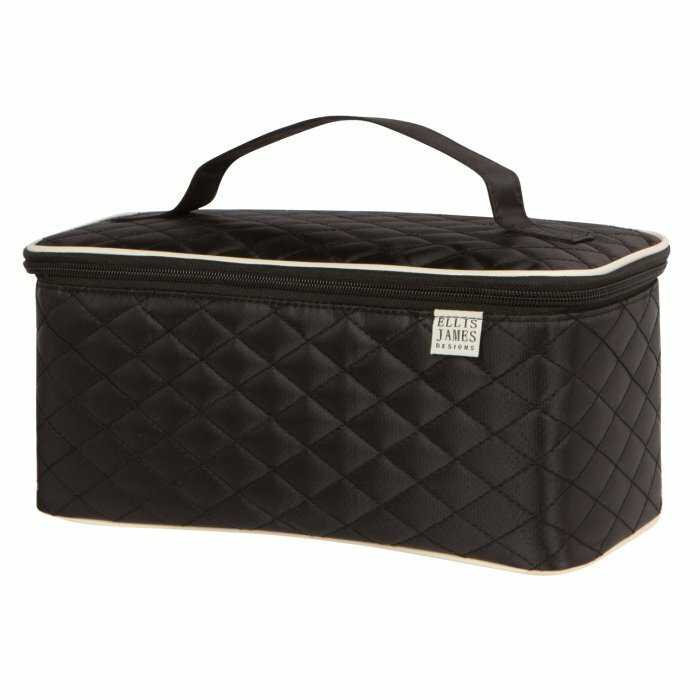 And, if I ever end up needing to travel, I know this bag will be an absolute godsend to keep my medication in one place. There is also room on the top for me to store my Cefaly TENS unit for travel, as well as a spot for a Sharpie to mark bottles, a small pouch on both ends of the bag for blister pack pills, a discreet zipper pouch along the back, and yet another mesh pouch on the lid, which I used for a pill splitter. I highly recommend this for anyone who needs a way to keep their pills organized. Great bag. I love that it’s soft so it will fit in luggage easily, but it has structure too! I wish it was a double zipper (compartment). I don’t like to mix toiletries with make up. Otherwise, it’s a great case. FYI, my flat iron is standard size and it fits. Perfect length. 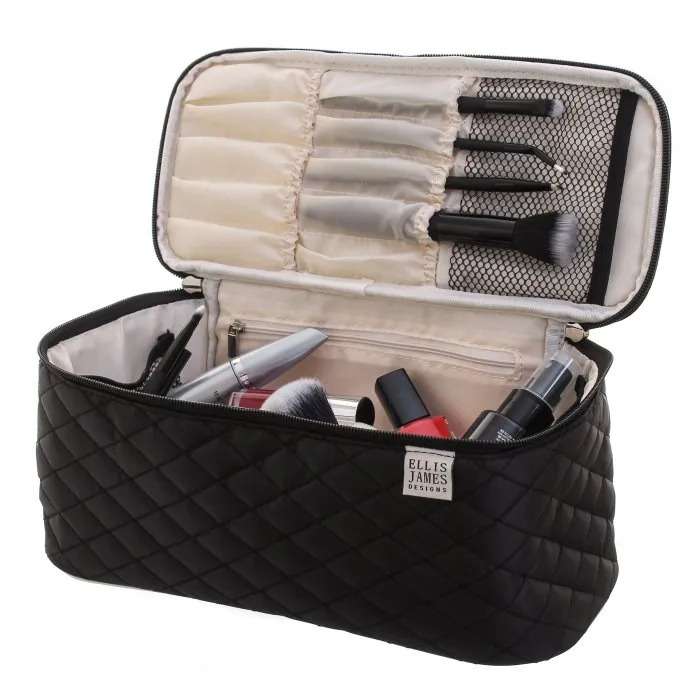 Most cosmetic bags are to short to put a standard flat iron or curling iron in. This one is not. I hate minature travel irons and curlers so I can use this one to travel in style. 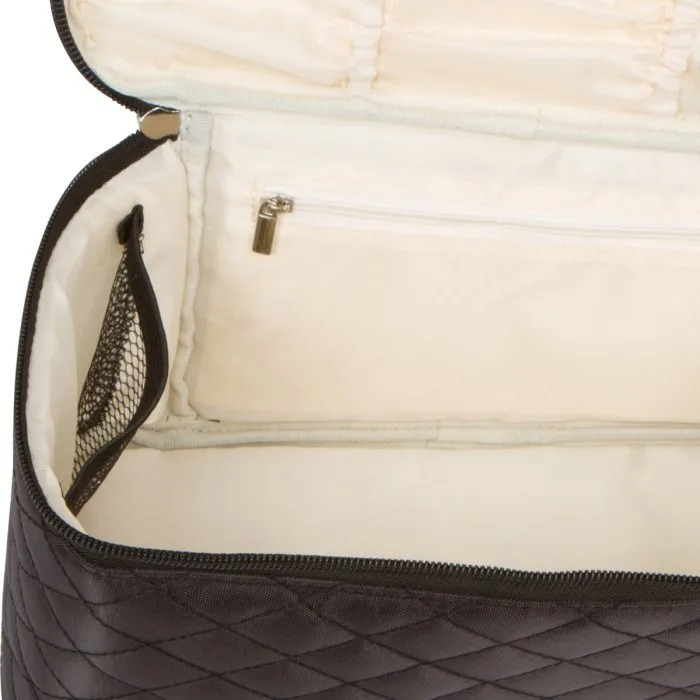 This is a very nicely made makeup bag. Love the slots inside to slide brushes/mascara in that makes them so easy to find. Also wipes out easily if you need to. It’s also stiff so it keeps its shape which I love! fast accurate and a great travel bag, when we got the 1st one, we immediately reordered ! love the style of the bag and the size is amazing! I love this make-up bag. I use it to store my facial products and makeup within an easy reach since I don’t have enough counter or accessible space. It is well made and the zippers glide smoothly. I like the fact it’s a soft case since it seems easier to work with than a hard case. I didn’t really care for the branding tag on the front, but that is a minor point. LOVE IT!!! I have bought 4 different bags and this is the only one that actually organizes everything and holds all my makeup. Definitely worth every penny!! OMG loved this, carried makeup plus more during my trip. Very useful and organized everything. More so dumped everything in, but it held a lot more than I expected. And good material.